"Looking for fun ideas for a kid's birthday party, a bake sale, or to celebrate Halloween? 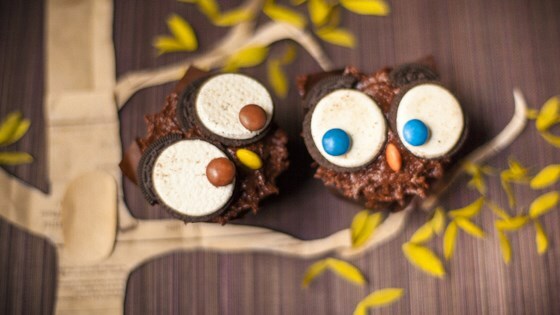 Try these cute owl cupcakes that are extremely easy to make. All you need are cookies, some M&Ms, and a little creativity!" Preheat oven to 350 degrees F (175 degrees C). Line 2 muffin tins with paper liners. Combine 2 cups sugar, flour, 1 cup cocoa powder, baking powder, salt, and baking soda in a bowl. Whisk buttermilk, vegetable oil, eggs, and vanilla extract in a large bowl. Add flour mixture; mix until well-combined. Pour in hot water; stir until batter is smooth. Divide batter evenly among muffin tins. Bake in the preheated oven until a toothpick inserted into the center comes out clean, about 12 minutes. Transfer cupcakes to a wire rack and let cool completely, about 20 minutes. Whip 3/4 cup plus 1 1/2 tablespoon heavy cream in a bowl with an electric mixer until soft peaks form. Fold in 1 1/2 cup plus 2 tablespoons mascarpone cheese, 7 tablespoons cocoa powder, and 1/4 cup sugar gently to make frosting. Spread 1 tablespoon frosting over each cooled cupcake. Twist chocolate sandwich cookies open, leaving all cream filling on 1 side. Place 2 cookies, cream filling-side up, on each cupcake to make owl eyes. Place a brown milk chocolate piece on each cookie to create pupils. Insert an orange or yellow milk chocolate piece in the center to make a beak. Reserve the plain Oreo® halves for other recipes, such as an Oreo® cheesecake or milkshake, or you can crush them to make a cookie crust. Substitute Smarties® for the M&M's® if desired.